At long last, one of the most storied rivalries in college sports is renewed in week one. Were it not for Notre Dame's 2012-2013 seasons being vacated for using ineligible players, the title for “winningest program” would be on the line (I'm ok with keeping the 2012 game out of the record books). Instead, playoff contention and a top 10 ranking are on the table as both teams have a lot to prove. Michigan - Notre Dame has always been a series of chaos and this game will surely be no different. Having made September Heisman candidates out of Tate Forcier, Denard Robinson, and Devin Gardner, Shea Patterson is now up to bat. For the first time in Jim Harbaugh's coaching career at Michigan, he has named a starting quarterback two weeks before the opener. 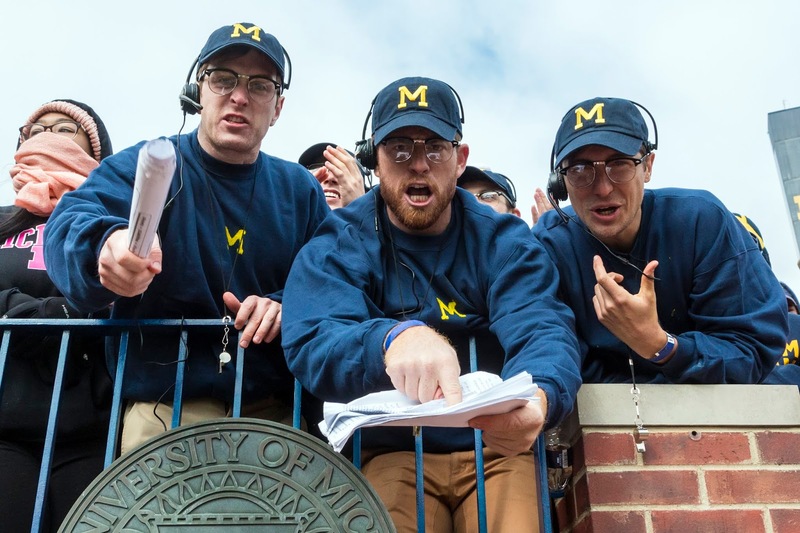 This is because for the first time in Jim Harbaugh's coaching career at Michigan, he has had a starting quarterback two weeks before the opener. Notre Dame returns most guys from a defensive squad that finished #27 in S&P+ last year. They were a solid-not-elite unit that got the job done against anyone not named Miami (41 points), Stanford (38 points), or *squints* Wake Forest (37 points)? 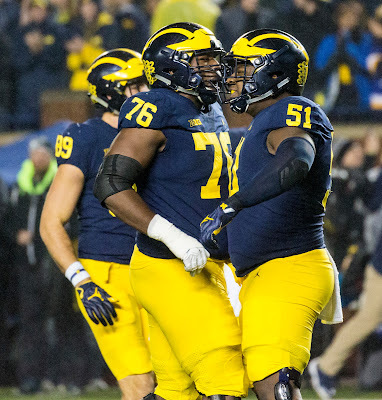 Michigan Center Cesar Ruiz has said the offensive line will be a strength for the Wolverines this year. Notre Dame will tell us a lot in week one if this is true. The key battle for the Wolverines will be along the lines. Notre Dame's defensive line comes with experience and depth, led by Senior DT Jerry Tillery (6'7”, 305 lbs – 56 tackles, 9 TFL, 4.5 sacks in 2017). 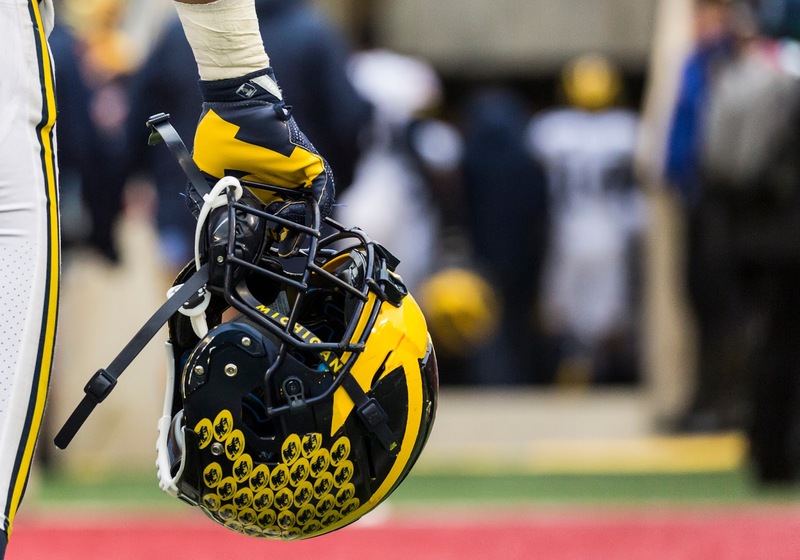 He will be an early test for Michigan's interior line which could actually be... good? The true test will be how the tackles (as of now, Juwann Bushell-Beatty and Jon Runyan Jr., with James Hudson making a push) will handle against Notre Dame defensive ends Khalid Kareem (5.5 TFL, 3 sacks, 6 QBH), Daelin Hayes (6.5 TFL, 3 sacks, 4 QBH), and Julian Okwara (4.5 TFL, 2.5 sacks, 7 QBH). These are not All-American level ends but may look the part if Michigan's situation at tackle has not improved. At linebacker, the Irish return Te'Von Coney, who worked his way to a starting role in 2017 and finished the year with 116 tackles, 12.5 TFL, 3 sacks, and a forced fumble. He is joined with Drue Tranquill at inside linebacker and senior Asmar Bilal at the 'rover' position (Notre Dame's version of the LB/S hybrid). 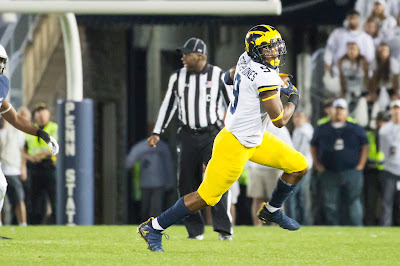 If Karan Higdon's offseason workout routine and 15 added pounds have really turned him into a possible All-American mini-Hulk, this will be his opportunity to prove it. Notre Dame's corners are a strength of the Irish defense, but their depth drops off pretty quickly. Their #1 corner, Julian Love, had 20 pass break-ups, 68 tackles, and 3 interceptions last year (2 of which were touchdowns). He's joined by Troy Pride Jr. (22 tackles, 2 PBU, 1 INT) and rising junior Donte Vaughn. The Irish took a huge blow earlier this week when senior nickelback Shaun Crawford suffered his 3rd season ending leg injury. His 2017 season included 32 tackles, 1.5 sacks, 5 PBU, 1 FF, and 2 INT. Expect Grant Perry to have a big day exploiting this loss in the slot, along with the tight ends. I wish I could say more about the wide receivers in this match-up, but currently there are still too many question marks in the passing game. When Rashan Gary and Chase Winovich are set loose and Brandon Wimbush has to throw against a top five defensive back unit, this could get ugly. Wimbush's QB rating of 121.4 ranks #98 of D-I QBs on ESPN's 2017 list. Where the Irish excelled last season was in the run game, Notre Dame finished the season with 3501 yards (#8, behind Alabama's 3509 yards). Much of that production has been lost in the offseason. The Irish drafted two offensive linemen in the first 10 picks of the 2018 draft from this unit in guard Quenton Nelson and tackle Mike McGlinchey. The Irish still have preseason 2nd team All-Americans guard Alex Bars and center Sam Mustipher. Notre Dame's lead rusher Josh Adams (1430 yards, 6.9 avg) plays for the Eagles now. The Irish also had tight end Durham Smythe and wide receiver Equanimeous St. Brown taken in the draft. Notre Dame will rely heavily on their running game. 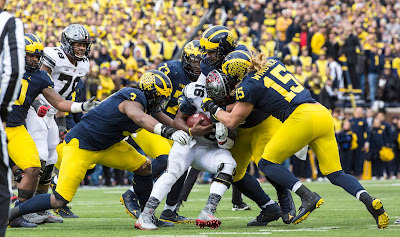 The Michigan defensive line will consume. The Irish do still have running back Dexter Williams who rushed for 360 yards on 9.2 YPC(!)... maybe. His status is up in the air with rumors that he is facing a four game suspension (FWIW Brian Kelly has stated that he would be dressed and available). At wide receiver, Notre Dame has Miles Boykin, who did this in the bowl game. A 6'4" receiver who only had 253 receiving yards last season but will have the opportunity to step up in a big way. At tight end, Alize Mack looks to replace Durham Smythe. Notre Dame's receiving and tight end corps can be summed up with one word: unproven. 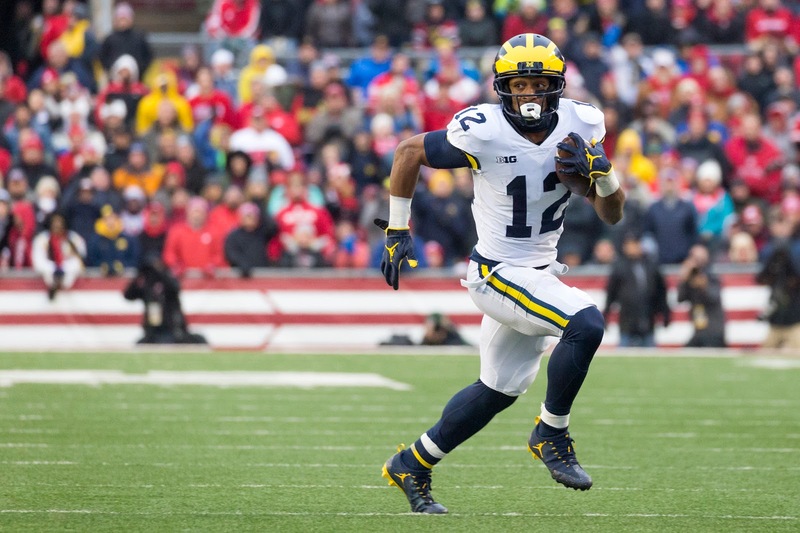 They certainly have size and talent, but the question will be can Wimbush get them the ball? Shea Patterson is the hero Michigan needs him to be. Cesar Ruiz's comments about the offensive line being a strength this season are at least somewhat true and the interior pushes an experienced Notre Dame line back enough for Karan Higdon and Chris Evans to deliver a one-one punch. 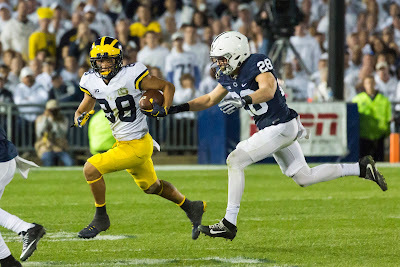 The tackles hold serve well enough for Shea to do his thing.The wide receivers take the freshman-sophomore leap and show why they were one of the best receiving classes in the 2017 season. The Michigan defense performs as expected and shuts down Notre Dame's run game, forcing Wimbush to pass with little success. Notre Dame exploits the Michigan tackles enough to dismantle Shea Patterson's passing game and shades of last season's offense are revealed. The Irish show why they were number 8 last season in rushing yards and are able to put out a dual-attack between Wimbush and the running backs. This opens up the pass game and Wimbush gets some lucky shots downfield. Also it rains and the stupid things that tend to happen in this rivalry point towards Notre Dame. Welcome to week one thunderstorm chaos game. On paper it looks like Michigan has the marginal advantage, but there are too many questions on Michigan's offense to say for sure (luckily these questions lean towards the positive). Notre Dame has its share of question marks at receiver and in their defensive backfield depth. This game could come down to how Brandon Wimbush plays, which could mean doom for either team. 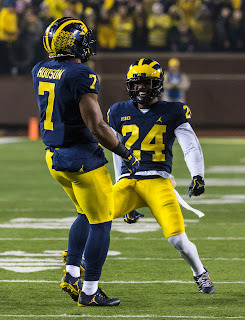 Michigan should have the clear advantage on defense, however, which should be the difference maker.